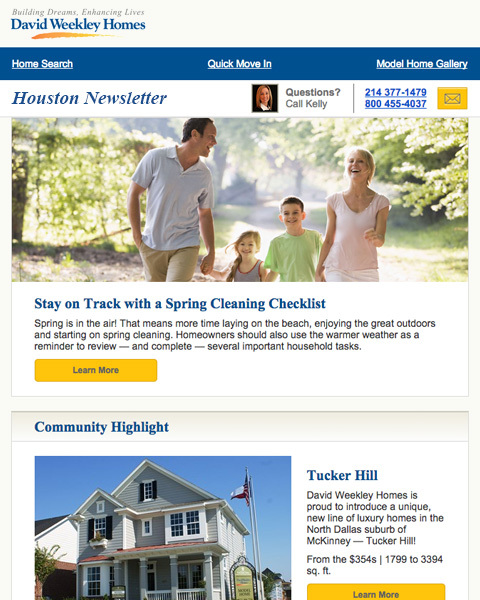 Our Home Club electronic newsletter is packed full of valuable information that will help you find a new home. As a subscriber, you’ll be the first to learn about our current city-wide promotions, read seasonal tips, discover do-it-yourself project ideas and much more! Three Great Reasons to Sign Up Today! Here, you’ll read about design trends to keep your home looking great. Our Design Consultants share their expertise in the latest trends to fit every taste and budget. Sometimes the hardest part of being a Homeowner isn’t moving in – it’s maintenance. When do you need to flush out your drain lines or service your air conditioner? With our Homeowner tips, you’ll never be in the dark about how to keep your home in tip-top shape. Did you know that we have incentives for Homebuyers in many of our markets? Decorator allowances, home discounts and covered closing costs – with HomeClub, you won’t miss an opportunity to save on your new home. With these great reasons, why wait?